I don’t know if I’ve ever seen Gary Cooper look as miserable in any film as he did in the 1949 film, The Fountainhead. In The Fountainhead, Gary Cooper plays Howard Roark. Roark is an architect who we are repeatedly told is brilliant. However, he’s always has to go his own way, even if it means damaging his career. At the start of the film, we watch a montage of Howard Roark losing one opportunity after another. He gets kicked out of school. He gets kicked out of the top design firms. Howard Roark has his own vision and he’s not going to compromise. Roark’s a modernist, who creates sleek, powerful buildings that exist in defiance of the drab, collectivist architecture that surrounds them. Howard Roark’s refusal to even consider compromising his vision threatens the rich and the powerful. A socialist architecture critic with the unfortunate name of Ellsworth Toohey (Robert Douglas) leads a crusade against Roark. And yet, even with the world against him, Roark’s obvious talent cannot be denied. Dominique Francon (Patricia Neal) finds herself enthralled by the sight of him working in a quarry. Fellow architect Peter Keating (Kent Smith) begs Howard to help him design a building. Newspaper publisher Gail Wynard (Raymond Massey) goes from criticizing Howard to worshipping him. Have I mentioned that Howard Roark doesn’t believe in compromise? If you have any doubts about this, they’ll be erased about halfway through the movie. That’s when Roark responds to a company altering one of his designs by blowing up a housing project. Roark is arrested and his subsequent trial soon turns into a debate between two opposite philosophies: individualism vs. collectivism. So, let’s just start with the obvious. Gary Cooper is all wrong for the role of Howard Roark. As envisioned by Ayn Rand (who wrote both the screenplay and the novel upon which it was based), Roark was meant to be the ideal man, a creative individualist who has no doubt about his vision and his abilities. 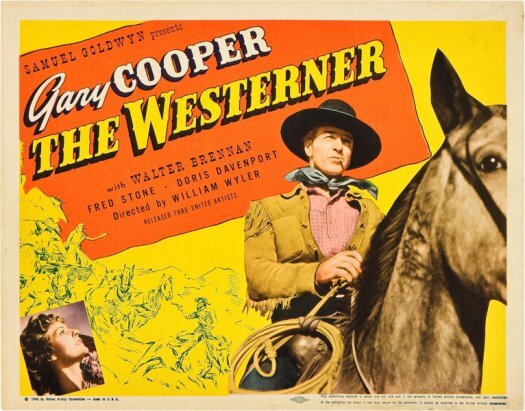 Cooper, with his down-to-Earth and rather modest screen persona, often seems to be confused as to how to play such a dynamic (some might say arrogant) character. When Roark is meant to come across as being uncompromising, Cooper comes across as being mildly annoyed. When Roark explains why his designs must be followed exactly, Cooper seems to be as confused as the people with whom Roark is speaking. It doesn’t help that the 47 year-old Cooper seemed a bit too old to be playing an “up-and-coming” architect. In the book, Roark was in his 20s and certainly no older than his early 30s. Cooper looks like he should be relaxing in a Florida condo. If you can overlook the miscasting of Gary Cooper, The Fountainhead‘s an entertaining film. 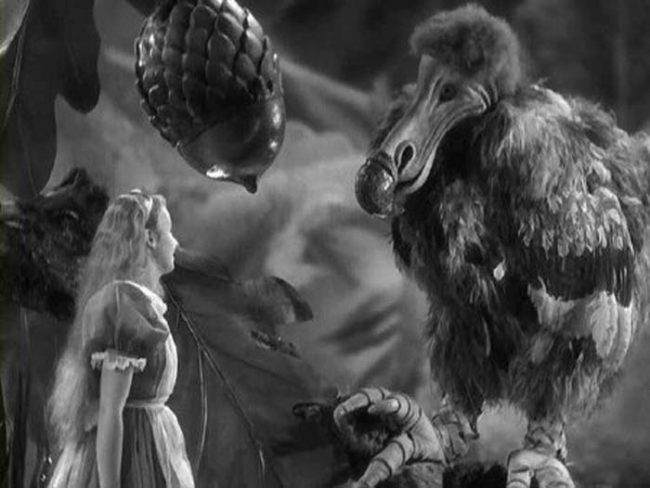 King Vidor directs the film as if it’s a fever dream. The film’s dialogue may be philosophical but the visuals are all about lust, with Pat Neal hungrily watching as a shirtless Gary Cooper breaks up rocks in the quarry and Vidor filling the film with almost fetishistic shots of phallic Howard Roark designs reaching high into the sky. If Cooper seems confused, Neal seems to be instinctively understand that there is no place for underplaying in the world of The Fountainhead. The same also holds true of Robert Douglas, who is a wonderfully hissable villain as the smug Ellsworth Toohey. Interestingly, the film ends with a suicide whereas the novel ended with a divorce because, under the production code, suicide was apparently preferable to divorce. I guess that’s 1949, for you. Because America is currently having a socialist moment, there’s a tendency among critics to be dismissive of Ayn Rand and her worship of the individual above all else. Rand’s novels are often dismissed as just being psychobabble, despite the fact that, in some ways, they often seem to be borderline prophetic. (Barack Obama’s infamous “You didn’t build that!” speech from 2012 could have just as easily been uttered by Ellsworth Toohey or one of the many bureaucrats who pop up in Atlas Shrugged.) Here’s the thing, though — as critical as one can be of Rand’s philosophy, there’s still something undeniably appealing about someone who will not compromise their vision to the whims of the establishment. It’s goes beyond politics and it gets to heart of human nature. We like the people who know they’re talented and aren’t afraid to proclaim it. (Modesty, whether false or sincere, is a huge turn off.) We like the people who take control of situations. We like the people who are willing to say, “If you don’t do it my way, I’m leaving.” In a way, we’re all like Dominique Francon, running our hands over architectural models while trying to resist the temptation to compromise and accept something less than what we desire. We may not want to admit it but we like the Howard Roarks of the world. Even when they’re played by Gary Cooper. High Noon is a testament to the power of simplicity. It’s a famous film, one that continues to be influential and which is still studied today. It’s known for being one of the greatest westerns ever made but it’s also a powerful political allegory. Even people who haven’t seen the film know that High Noon is the moment of the day when someone shows their true character. Just as everyone knows the plot of Star Wars, regardless of whether they’ve actually watched the film, everyone knows that High Noon is about a town marshal who, after the entire town deserts him, is forced to face down a gang of gunmen on his own. And yet, it really is a surprisingly simple movie. It’s the quintessential western, filmed in black-and-white and taking place in the type of frontier town that you would expect to find hiding on the back lot of an old movie studio. Though wonderfully brought to life by a talented cast, the majority of the characters are familiar western archetypes. There’s the aging town marshal, a simple man of integrity. Gary Cooper won an Oscar for playing the role of Will Kane. When we first see Will, he’s getting married in a frontier courtroom. All of the town leaders have come to his wedding and all of them wish him luck in the future. Will is retiring and everyone agrees that the town would never have survived and prospered if not for Will Kane. After all, Will is the one who captured the notorious outlaw, Frank Miller. When the news comes that Miller has been pardoned and will be arriving back in town on the noon train, everyone tells Will that he should just leave town and go on his honeymoon. However, the new marshal will not be arriving for another day and Will is not willing to abandon the town. However, the town is more than willing to abandon him. Will’s new wife is Amy Fowler (Grace Kelly). Amy is a Quaker and a pacifist. Amy begs Kane to leave town but Kane says that he’s never run from a fight. Amy tells him that she’ll be leaving on that noon train, with or without him. Helen Ramirez (Katy Jurado) is the former girlfriend of both Kane and Miller. She is one of the few people in town to call out everyone else’s cowardice but she is still planning to leave before Miller arrives. As she explains it to Amy, she would never abandon Kane if he were her man but he’s not her man anymore. The townspeople, who first appear to be so friendly and honest, soon prove themselves to be cowards. None of them are willing to stand behind Will. The Mayor (Thomas Mitchell) publicly castigates Will for staying in town and putting everyone else in danger. Deputy Harvey Pell (Lloyd Bridges) says that he’ll only help Will if Will recommends him as his replacement. The town minister (Morgan Farley) is more concerned with why Will was married by the justice of the peace, instead of in the church. The town judge (Otto Kruger) leaves early, saying he can be a judge in some other town. One of the few people to show Will any sympathy is the former marshal (Lon Chaney, Jr.) but, unfortunately, he is too old and crippled by arthritis to provide any help. Though it all, Frank’s gang sits at the train station and waits for Frank to arrive. One gang member is played be Lee Van Cleef. He looks really mean! With a brisk running time of 84 minutes, High Noon unfolds in real time. Throughout the film, as Kane grows increasingly desperate in his attempt to find anyone brave enough to stand with him, we see clocks in the background of nearly every scene. We hear the ticking. We know that both noon and Frank Miller are getting closer and closer. We know that, soon, Will will have no other option but to stand on the street by himself and defend a town that doesn’t deserve him. It’s simple but it’s undeniably powerful. It’s been said that High Noon was meant to be a metaphor for the blacklist. Frank Miller and his gang were the fascists that, having been defeated in World War II, were now coming back to power. Will Kane was a stand-in for all the men and women of integrity who found themselves blacklisted. The townspeople represented the studio execs who refused to challenge the blacklist. That’s the theory and it’s probably true. But, honestly, the political metaphor of High Noon works because it can be applied to any situation. Will Kane is anyone who has ever had to face down the forces of totalitarianism. He is anyone who has ever had the courage to take a lonely stand while everyone else cowered in the corner. It’s a powerful metaphor and it’s also a genuinely entertaining movie. The gunfight is thrilling. The romance between Will and Amy feels real. Even the town feels like an actual place, one that has its own history and culture. It’s a simple film but it’s a great film. Like a lot of great films, High Noon was nominated for best picture. And, like a lot of great films, it lost. 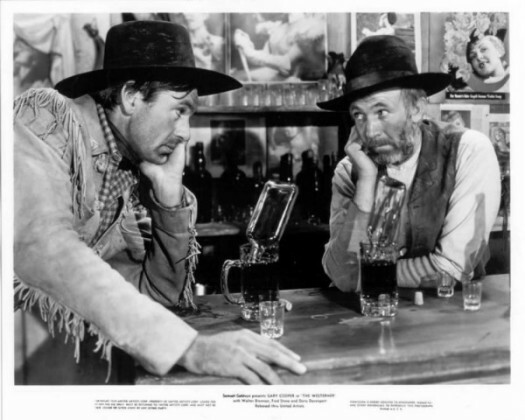 In High Noon‘s case, it lost to a film that is almost its exact opposite, The Greatest Show on Earth. However, Gary Cooper did win an Oscar for his unforgettable performance as Will Kane. I think we tend to take classic films for granted. Don’t do that with High Noon. See it the next chance you get. 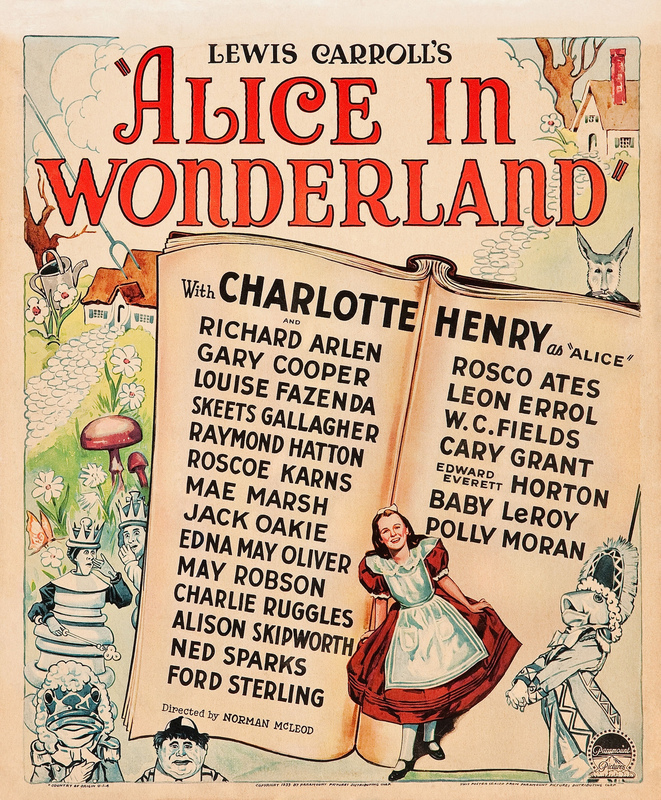 Lewis Carroll’s 1865 children’s classic ALICE IN WONDERLAND was turned into an all-star spectacular by Paramount in 1933. But the stars were mostly unrecognizable under heavy makeup and costumes, turning audiences off and causing the film to bomb at the box office. Seen today, the 1933 ALICE is a trippy visual delight for early movie buffs, thanks in large part to the art direction of William Cameron Menzies. Reportedly, Ernest Hemingway hated the 1932 film adaptation of his great novel, A Farewell To Arms. The novel, of course, tells the story of ambulance driver Frederic Henry (played in the film by Gary Cooper), his service in World War I, and his doomed love affair with an English nurse named Catherine (played by the very American Helen Hayes). The novel was acclaimed for being tough and unsentimental. The film is the exact opposite, revealing itself to be more typical of the work of director Frank Borzage than Ernest Hemingway. How romantic was Borzage’s adaptation of A Farewell to Arms? It was so romantic that it even changed the novel’s famous ending. The novel ended with Catherine dying and Frederic Henry walking away, alone and in the rain. The film, however, ended with Catherine miraculously recovering. Never mind, of course, that having Catherine survive pretty much defeated the entire purpose of the story. What was important was to give American audiences a happy ending! However, European audiences got a more downbeat ending. In the European version, Catherine does die. After she dies, Frederic picks up her body and looks up into heaven, which is certainly far more dramatic (and, in its way, sentimentally spiritual) than anything to be found in Hemingway’s novel. 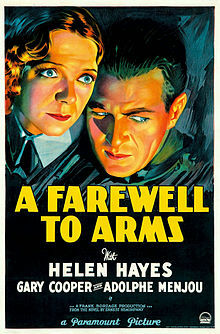 If, like me, you see A Farewell To Arms on TCM, you’ll see the European ending. So, yes, I can understand why Hemingway would have hated this film. But I have to admit that I rather enjoyed it. The film adaptation makes for terrible Hemingway but it’s great Borzage. Borzage specialized in making grand, lyrical, and sweeping romantic melodramas and that’s what his version of A Farewell To Arms truly is. Helen Hayes may not be convincingly English and Gary Cooper may be a bit overly earnest for a Hemingway hero but they both look good together and they have great chemistry. (Plus, Adolphe Menjou gives a good supporting performance as Frederic’s best friend.) As a director, Borzage keeps the story moving at a steady pace and plays up the romance in every single scene. There’s a great sequence that’s filmed entirely from the wounded Frederic’s point-of-view as he’s brought into a hospital and looked over by a series of officious nurses. We see everything through Frederic’s eyes until Catherine finally enters the room and kisses him. Only then do we see Frederic and Catherine together, leaving us with no doubt that these two belong together. A Farewell To Arms may not be a great literary adaptation but it is a great cinematic romance. A Farewell To Arms was nominated for best picture but it won to a largely forgotten film called Cavalcade. After I watched The Pride of the Yankees, it was time to watch For Whom The Bell Tolls on TCM. Based on the classic novel by Ernest Hemingway, the film version of For Whom The Bell Tolls was released in 1943 and, when I first started watching it, I was a little bit worried. For, you see, For Whom The Bell Tolls is an extremely long film. It’s a film that takes its time. It’s also a very talky film and I have to admit that one reason I was worried was because the movie started at 11:30 and it was scheduled to last until 2:15 a.m. Oh my God, I wondered, as the film started to slowly play out before me, am I going to end up dozing off before this is finished? Well, I need not have worried. Yes, For Whom The Bell Tolls does take a while to get started but it all pays off in the end. By the time the film concludes, you realize why it had to take its time and why we had to spend so much time listening to these characters talk about what they did in the past, why they’re doing what they’re doing in the present, and what they’re hoping for in the future. Not that all of the characters have a future. At the start of the film, Robert Jordan (Gary Cooper) gets his palm read by Pilar (Katina Paxinou). Pilar refuses to tell him what she saw in his future but it’s not difficult to guess. Robert is on a suicide mission and everyone knows it. Even when he falls in love with the beautiful Maria (Ingrid Bergman), he does so with the knowledge that he’ll be dead in just a few days. Robert is an idealistic American who, as the film opens, is in Spain. It’s the 1930s and Spain is embroiled in a civil war between fascists and guerrillas … well, if you’ve read Hemingway’s novel, you know that the guerrillas are communists. But this is a Hollywood film so, for the most part, we don’t hear much about ideology. But, then again, audiences in 1943 undoubtedly remembered the Spanish Civil War and understood that the guerrillas were fighting the forces of Gen. Francisco Franco. And, for audiences today, all that matters it that the guerrillas are trying to overthrow a government. Seriously, who doesn’t want to see the government overthrown? Robert is fighting on the side of the guerrillas. In four days, a major offensive is going to be launched against the fascists and, in order to keep fascist forces from pursuing the guerrillas, Robert has been assigned to blow up a mountain bridge. Robert knows that he won’t survive this mission and, as he waits to die, he camps out with a small guerrilla band that is led by Pablo (Akim Tamiroff). At first, Pablo refuses to take part in a mission that he considers to be futile but he is overruled by his strong-willed wife, Pilar (Katina Paxinou). Among Pablo’s group is the beautiful Maria (Ingrid Bergman), a young woman whose family was killed by the fascist forces. Robert and Maria fall in love, even as Robert prepares for his eventual death. And then, finally, after two hours of screen time, Robert and the guerrillas head for that bridge and suddenly, we understand why the film took its time to reach this point. By the time Robert reaches the bridge, we’ve come to know and care about both him and the other guerrillas. And, as a result, we care about whether or not they survive. When the fascists launch their own counter attack, every death counts. We feel the loss of every casualty and we understand what they’re dying for. After two hours of talk, For Whom The Bell Tolls ends with a genuinely exciting and even moving action sequence. It all leads up to a final shot that will blow you away in more ways than one. From Whom The Bell Tolls is a film that will reward those with the patience to stick with it and I’m glad that I turned out to be one of those people. It was nominated for Best Picture of 1943 but lost to another film about an anti-fascist who fought in Spain, Casablanca.